Animals have always been an integral part of Missouri’s farming heritage. In fact, Missouri ranks second in the country in cattle, fourth in turkeys and in the top 10 for hogs and poultry. But, with great production comes great responsibility when it comes to keeping Missouri farmers safe. Overall, 17 percent of all farm injuries involve animals. Statistics show that beef cattle farms and dairy operations are ranked second and third in injuries among all farming activities. Animals are calm and work well when they have an established routine to their day. Having the same feeding, milking or grooming time each day will tame an animal, and they will behave calmly. Animals sense their surroundings differently than humans. They have difficulty accurately judging distances, so one quick movement can easily spook them. Livestock have extremely sensitive hearing and can hear sound pitches that humans often cannot hear. This is why loud noises scare animals and high frequencies can hurt their ears. When paired with unknown surroundings, loud noises will cause animals to be edgy and uneasy. Animals can sense when someone is scared or nervous around them. Because of their size and weight, they can be dangerous without intending to be. When working with animals, move slowly and lightly touch them to encourage them to move, instead of shoving or hitting them. Never prod an animal when it has nowhere to run. If you are working in close proximity with animals, plan an escape route in case the animals become aggressive. It is a natural instinct for animals to be extremely territorial. They are determined to protect the area they feel belongs to them, including offspring, other animals in their herd and the pasture where they live. Take extra caution during feeding times, and stay out of the way as much as possible. If you cannot avoid the animals, watch for signs of aggression or fear for possible danger. Always leave yourself an escape route in case animals become aggressive. Disease can spread like wildfire through animals and facilities. Sales and service personnel always have the potential to carry diseases between farms. It’s important to monitor all entries where there could be direct contact with your animals. Create sanitary stations at entry points to facilities for workers and guests to clean their shoes and hands before entering, or offer protective equipment to wear while visiting your facility. To decrease the risk of injury, clear work areas of tripping hazards such as uneven walking surfaces, high door sills or cluttered alleyways and chutes. Animals, domestic or wild, can be a cause of human illness. There are several diseases that can be transmitted between animals and humans. In indoor and confinement facilities, flooring should allow water to drain with ease. Slatted flooring allows the facility to be cleaned quickly and efficiently to remove chemical and animal waste. Fencing and panels should be kept in prime condition when working with crowded or excited livestock. A rusty nail or loose bolt can cause injury to farmers, as well as livestock. Repair all gaps in pens before putting animals in a confined space and be sure all pens, alleys and chutes will permit animals to pass through without causing injury to their heads, backs and sides. 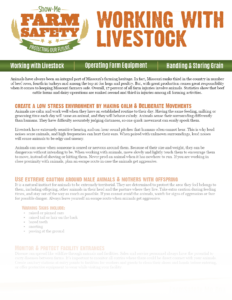 Dressing appropriately when handling livestock is an essential step to protecting yourself. There are 26 bones in the human foot, all of which can easily be crushed if stepped on by an animal, whether a 200 lb. hog or a 2,000 lb. bull. Wear a sturdy pair of work shoes or boots with steel toe caps to prevent foot and ankle injuries. Non-skid soles can also combat uneven or wet footing, which are common in livestock facilities. Wearing gloves when working with animals is necessary to protect your hands from vaccinations and chemicals, feces or diseases that can be transmitted from animals to humans. You should wear sterile gloves when vaccinating or operating on animals, and cotton or leather gloves when working or loading livestock for transportation. Working with and feeding livestock tends to stir dust into the air. Wearing a dust mask when working with animals will keep the harmful dust out of your lungs. “Farmer’s lung” is one of the most immobilizing diseases among farmers, specifically dairy farmers. Farmer’s lung is caused by inhaling the dust from moldy forages or grains, like hay. Depending on the type and length of exposure, all dust can cause health issues for those working in it. Farmer’s lung can go undetected after exposure and the symptoms can be confused with symptoms for bronchitis or pneumonia. If not treated quickly, farmer’s lung can cause irreversible lung damage and even death. It is important to run a safety check on your trailer and the towing vehicle before hauling animals, especially on public roads. Be conscious of the trailer’s weight limit. You can prevent overloading by making sure every door is easily shut and allowing animals to have space so they don’t overheat. Make sure all latches, chains and hooks are intact and functional at each entry point to the trailer. If the trailer has wood floorboards, examine them to be sure there isn’t any rotting or holes in the floor. Ensure the trailer hitch is properly attached to the vehicle and the trailer jack is raised off the ground to prevent equipment damage or accidents. 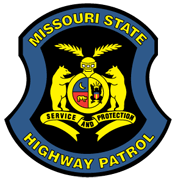 After the trailer is hooked to the towing vehicle, make sure all of the lights work and are correctly connected to the vehicle to ensure the safety of the animals, driver and others on the road. When transporting animals, it is essential to allow plenty of time to arrive at your destination.